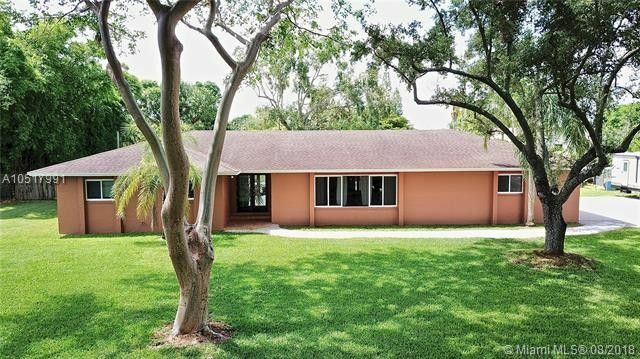 This beautiful 3 BR/2 BA home sits on almost an acre. Large 12x9 foyer entry with glass blocks. The living room has wood floors, crown molding & a big window. Dining room has French doors to the patio. Kitchen has wood cabinets, granite countertops, SS appliances, island w/a sink, eat-in area, pass thru window & French doors to the patio. Master bedroom has wood floors, crown molding, door to patio & walk-in closet. Master bath has 2 sinks, separate jacuzzi tub & shower. Large 25x58 screened patio with heated pool. Pool has a valet in-floor cleaning system. Home also has a 45x15 covered patio w/a fireplace. Property is fully fenced & has a tree house. 2 horse stalls on a slab w/2 turn outs.